Government regulators and the taxi industry can’t stop Uber — but maybe a patent can. At least that’s the hope of Sidecar, a small rival of Uber whose founder obtained a patent related to mobile ride hailing way in 2002, and who claims he thought up today’s version of the industry way back in the 1990s. Meanwhile, Uber itself has been busy on the intellectual property front. The company has filed more than a dozen patent applications that seek a monopoly on not just Uber’s hated “surge pricing,” but also on other basic aspects of the car hire business such as dispatching and calculating tolls. All this raises the question of whether a patent battle, like the epic one between Apple and Google that roiled the smartphone industry, could break out among the car companies. 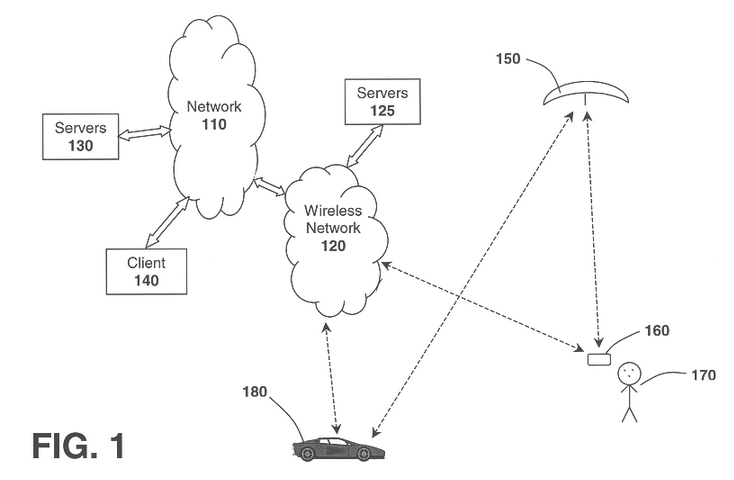 At first glance, Sidecar’s patent looks like it could bring Uber’s cars to a screeching halt. 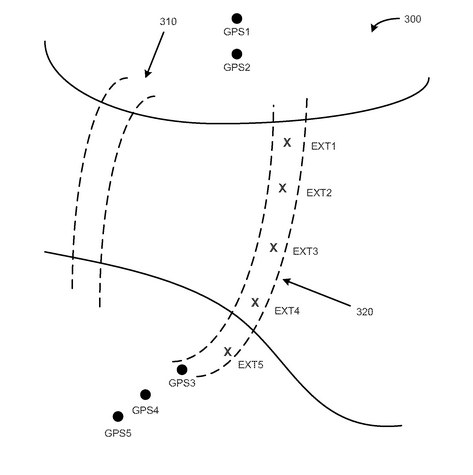 Titled “System and method for determining an efficient transportation route,” the patent describes the use of GPS-tracking to plot routes and connect drivers with passenger pick-up locations. 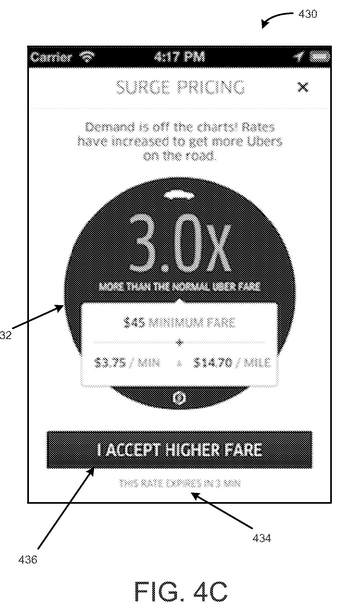 Uber’s earliest patent application, filed in 2010, is titled “System and method for operating a service to arrange transport amongst parties through use of mobile devices,” while others refer to more specific features of the company’s operations, which are based on consumers using an app to summon nearby drivers. All of these claims — related to tolls, driver-rating, services to “arrange transport” and so on — are for now just applications. But if the Patent Office grants Uber even some of these patents, the company could be in position to threaten its competitors, including Lyft and Sidecar, with the prospect of injunctions or multimillion dollar jury awards. A spokesperson for Uber declined to state how the company plans to use any patents that the Patent Office might bestow. As for Sidecar, the company simply replied “Yes” in response to an question as to whether it would exercise its 2002 patent. While patents in theory confer powerful 20-year monopolies, the reality can be different, especially when it comes to claiming abstract ideas. “This application is really seeking to claim the basic idea of pricing and service, which is a concept Adam Smith discussed 200 years ago. The notion that’s a new idea in this day and age is far-fetched,” said Michael Strapp, a patent lawyer with Goodwin Procter, in a recent phone interview. His comment was addressed specifically to the surge-pricing patent application, but Strapp is also skeptical that Sidecar’s patent or any of Uber’s proposed patents would stand up to scrutiny. His doubts stem in large part from recent rulings from the Supreme Court that have set stricter standards for the Patent Office. “Alice said tying a well-known idea to a computer or smartphone is ineligible,” said Strapp, referring to Alice v. CLS Bank, a seminal decision from last year that called into doubt the validity of thousands of computer-related patents. This means that Sidecar’s swagger with its 2002 patent could be a bluff, given that Uber or another defendant may have a good chance to invalidate it under the patent law doctrines of “obviousness” or “ineligible subject matter.” And likewise, the Patent Office may point to the stricter standards in order to deny Uber’s applications altogether. But despite what looks like a weak hand, Sidecar or another ride-booking service could try to start a patent war anyways. While patents can invoke images of “eureka” moments and grand invention, in practice they’re typically just another tactic — like talent raids or squeezing suppliers — by which businesses try to get the upper hand on competitors. And while the legal costs of a full-blown patent case can reach tens of millions of dollars, a company can also wield patents on the cheap. “If Sidecar was going to decide as a business matter that they were going to raise investment or look like a more viable competitor, they could [file a patent lawsuit] and take initial steps without a lot of costs, especially if they find a lawyer willing to operate on contingency,” according to Strapp, the lawyer. In this context, a Sidecar lawsuit could amount to leverage against Uber, either to encourage acquisition talks, or else to further founder Sunil Paul’s narrative that Sidecar is the real, original ride-booking company. The risk of course is that Uber or Lyft might respond with an aggressive legal approach of their own, perhaps by buying patents to launch a countersuit (Facebook used this approach successfully when Yahoo sued it in 2010 over the rights to social networking). And in the event Uber, which is known for bare-knuckle business tactics, succeeds in obtaining patents (or buys Sidecar), it has the deep pockets to hire as many lawyers as it thinks would help it to wipe every other car service off the map. For consumers, this would be a bad thing since the costs of a patent war in the ride-booking industry would be passed on to them. But for now, it’s too soon to fear the worst. Not only are patents in this area still few and far between, changing attitudes to patents among courts and entrepreneurs (remember what Tesla’s Elon Musk did last year) mean that war is less likely in the first place. HAHAHAHAHA!!! they are trying to patent because of all of the open source versions coming out that don’t force credit card on the users and allow open tipping and personal pay service for the driver. Which makes the open source apps entirely different apps and thusly no patent any of these morons could get would matter. Uber, Lyft and Sidecar depend on forcing credit card. Breathe it in folks, THE END IS NIGH FOR UBER, LYFT AND SIDECAR!!! There are thousands of transportation businesses already operating in this industry. Frequently while offering their own apps, websites. There are laws and regulations that these existing players are following. There is ZERO excuse to let $45 billion dollars Uber off the hook.